If you’re visiting for the first time, this is part four of a series. See links to prior entries in this series at the bottom. The Black rat is also known as the roof rat or climbing rat, and is about eight inches in length. The Norway rat is more commonly called the Brown, wharf or sewer rat, about 10 inches long. Rats teeth grow continually, and need to literally gnaw on hard things to wear them down. Their constant need to gnaw means that they are incredibly destructive and voracious. Rats will eat absolutely anything and chew through anything to get at it. You’d think that with this eating habit, they’d be able to throw up something that was making them sick. But no, rats can’t regurgitate nor can they burp and don’t experience heartburn. So, if you can coax them to eat something poisonous, they’re doomed. Of course, they’ve evolved to work around their digestive inadequacies. that have developed a resistance to blood-thinning agents. Rats are very smart. If they eat something and get sick, they’ll avoid that item. Therefore, poisons that require a large dose to kill but don’t kill the animal, because it only ate a small dose, cause bait shyness. Therefore, a poison bait that kills over time and ingested in small quantities is preferred because it does not cause bait shyness. Enter UW-Madison! You can read the entire history here, in sum, researchers at UW-Madison, with funding from Wisconsin Alumni Research Foundation (WARF) isolated the chemical compound that thins blood. It’s used today to help people prone to heart and other blood-related issues. WARF got to name it, this drug is commonly known as Warfarin, and medically known as Cumadin. When taken in large enough quantities over time, it will cause internal bleeding and it’s why rats haven’t taken over the entire planet. Warfarin is both odorless and tasteless, and is effective when mixed with food bait, because the rodents will return to the bait and continue to feed over a period of days until a lethal dose is accumulated. It may also be mixed with talc which accumulates on the animal's skin and fur, and is subsequently consumed during grooming. Apparently rats spend nearly as much time grooming themselves as they do destroying things. The use of Warfarin itself as a rat poison is now declining, because many rat populations have developed resistance to it, thank you Darwin, and poisons of considerably greater potency are now available. A major downside is that such rodenticides may also accumulate in birds of prey and other animals that eat the poisoned rodents or baits. Newer poisons are effective against animals that have developed a resistance to blood-thinning Warfarin. 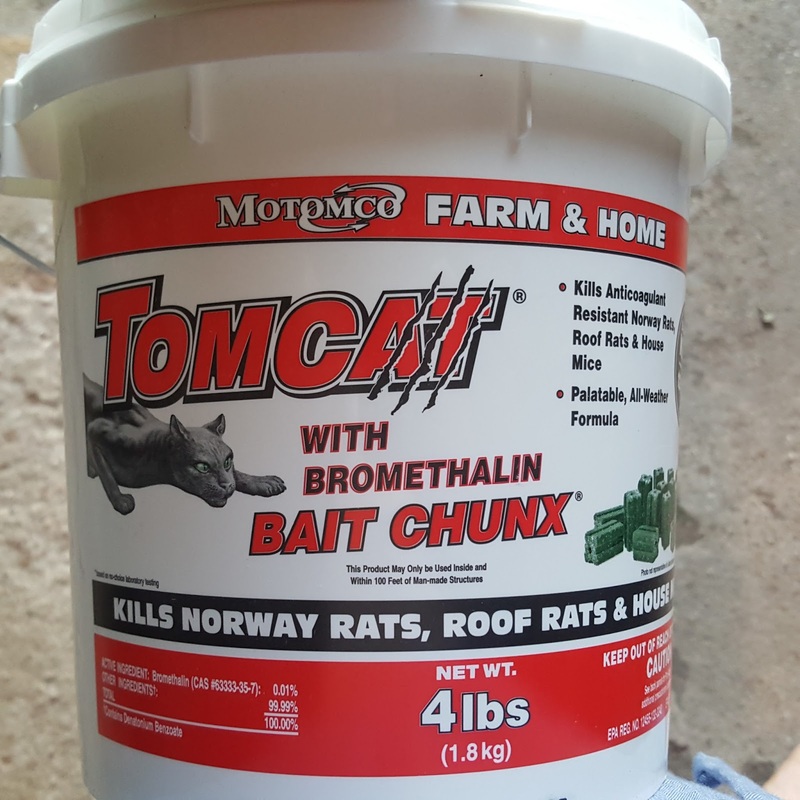 Bromethalin is a rodenticide which poisons the central nervous system, causing paralysis, convulsions, and death. As with any poison, it’s important (even if gross) for homeowners to remove and trash or bury dead rat carcasses so birds of prey or other animals don’t consume them and get sick or die.